When Kairi lost her heart, Riku allied himself with Maleficent to save her. Riku was actually the rightful master of the Keyblade, but once he chose darkness over light, the weapon chose Sora instead. Ansem exploited Riku's weakness of heart and possessed him. In order to seal the door to darkness, Riku stayed with the king on the other side. Sora journeys in hopes of finding Riku. A boy who was born and raised on a small group of islands. Riku dreamt of seeing other worlds, and so he forsook the islands – only to be seduced by the power of darkness. Enslaved by Ansem, pursuer of darkness, Riku clashed with his childhood friend Sora. But in the end he was able to regain himself and, together with Sora, closes the door to darkness. Still, the dark wounds in Riku’s heart have yet to mend. A chosen Wielder of the Keyblade and Sora's best friend since childhood. 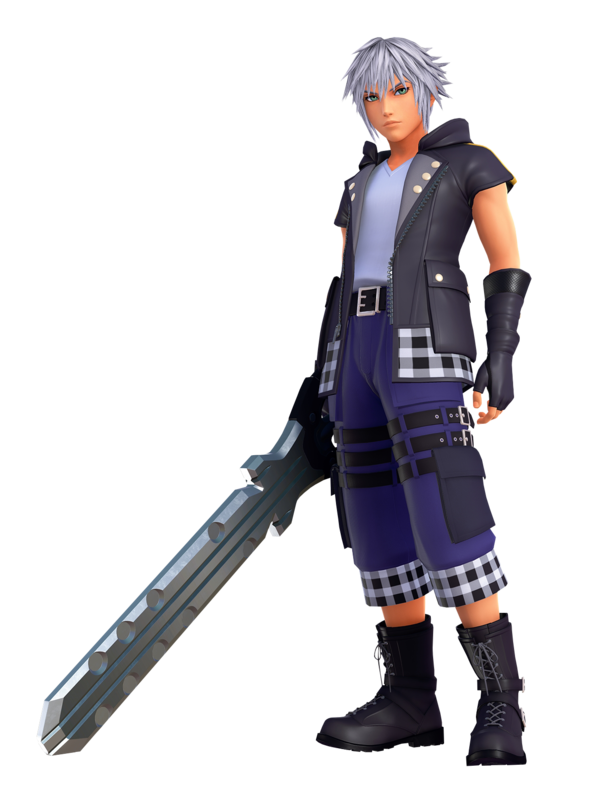 Due to the weakness of his Heart, Riku once fell to Darkness and betrayed Sora but paid the price when he lost his Body to Xehanort's Heartless. He reappeared in the Realm of Darkness when Xehanort was finally defeated by Sora, and together with Sora and Mickey he closed the Door to Darkness. When Sora was Sleeping to restore his Memories the Organization took apart, Riku was struggling with his own Darkness and eventually began wearing a black blindfold to try and hold the Darkness at bay. He eventually embraced the Dark powers when he fought Roxas, Sora's Nobody, in the hopes that reuniting Heart and Nobody will help Sora wake. He won, but his appearance changed into Xehanort's. No longer able to change back, he began calling himself "Ansem", the name Xehanort used. Not thinking himself worth of being reunited with his friends and hardly wanting them to see him in Xehanort's form, Riku hid in the Darkness and watched over his friends from afar. When the Organization attacked Hollow Bastion and Sora, Donald and Goofy were thrown into the Realm of Darkness, it was Riku who guided them back to the Realm of Light. He also gave them a box containing a picture of Roxas and the friends he made in Twilight Town, as well as a Sea-Salt ice cream popsicle. Both were clues to finding the truth about Roxas as well as keys to reaching the Organization's stronghold. Riku's presence became even more apparent to Sora in the Land of Dragons. Following the trail of Xigbar, an Organization member that came to create Nobodies for the Organization to use, Riku reached the oriental world. Mulan and Sora both chased him, having mistaken him for Xigbar. A short battle in which Sora and Riku fought both each other and the Heartless ensued, but Riku took off in the middle with a wave of the hand that clued Sora about his identity. Now wielding a Keyblade, Riku appeared in The World that Never Was to save both Naminé and Kairi from Saix and finally had one of his friends find out the truth about his fate. Reluctant, he stayed by the girl's side until she was reunited with Sora. He was about to leave, finding no place for himself in the happy picture that was his two friends enjoying their happy reunion, but then Kairi called out his name and held onto his arm. Riku could only look away when Kairi had Sora hold his hand and close his eyes, thus letting the brunette's Heart recognize Riku rather than have his eyes be deceived by his appearance. Now that he was both recognized and accepted by the friends he longed to see again, Riku finally let himself remain with them and fight alongside Sora. Together they defeated several Organization members and found Ansem the Wise who was attempting to decode the Organization's artificially made Kingdom Hearts into Data. The machine he was using exploded, and true to the man's declaration that anything might happen, Riku reverted back into his original appearance. Finally rid of Xehanort's shadow that lurked in his Heart, Riku abandoned his blindfold and returned to his rightful place as himself at his friends' side. Even though the final battles against Xemnas and what was left of his Kingdom Hearts were difficult, Riku fought alongside Sora to the bitter end. Together they fought and together they reached the Realm of Darkness where Riku found comfort in the one thing he had Sora could never imitate - having Sora for a friend. With their friendship fixed and stronger than ever, the two friends let their Hearts bring them back home, where they belonged. Finally, Riku managed to return to the world he once abandoned and be welcomed by all he held dear. Childhood friends with Sora and Kairi. He donned the Organization’s black coat pretending to be a member, and investigates their actions while waiting for Sora’s memories to be restored. Riku dashed forward across the crystalline white sand, dyed orange by the glow of the twilight sun. Engaged in a race with his best friend Sora, the two ran into the doorway and emerged on the upper level, surpassing Terra crossing the bridge and claiming their spots on the paopu tree. It wasn't long before Sora, noticing his father in the distance, decided to challenge Riku in a race back to the boats, and scurried off as fast as his legs could carry him before the older boy could even manage a reply. Deciding it wasn't worth the effort, Riku settled himself in a comfortable stroll and walked off. On his way back, he spared a chance to gaze at the older male the two boys had passed earlier, pondering by the water's edge. Realizing that the stranger did not reside in Destiny Islands and must clearly be from another world, he boldly voiced his thoughts, the beginnings of a smirk forming on his face as the man responded unlike that of which others would normally do, confirming his suspicion. The boy told Terra of the kid who was able to depart to other worlds, leaving behind the prison surrounded by water, and expressed his wishes in doing the same. He yearned to become stronger to protect the things that matter. Feeling a connection with Riku, Terra summoned his Keyblade, smiling as the boy's eyes grew wide. He knelt down, reciting the customary Rite of Succession speech, and bid him to grasp the Keyblade. Riku cautiously reached out him hand, tightening his grip on the weapon's handle, as if refusing to let go. Only when Sora called him away did he return to reality. He made a promise to Terra about keeping his conversation and the ceremony a secret, bid the older man goodbye and returned with Sora, playfully avoiding to reveal his newfound secret. Not long after Terra's departure did another stranger appear on the play island; the blue haired maiden Aqua. Riku was in another race with Sora, this time running just past the bridge. Just when the younger boy refused to admit defeat and requested another race, Aqua made her presence known, smiling brightly at the children and jumping down to their level. Silencing his thoughts about her being another off-worlder, Riku calmly answered her questions as Sora was almost jumping with excitement, possibly at having another friend to make. He didn't understand what she meant when she asked Sora to take care of him should he "go down the wrong path," so all he could do was watch as the troubled expression reverted back into a smile with Sora's agreement and the two boys made their way home. As Sora and Riku begin heading home after a peaceful night of star gazing on the beach, Riku notices that Sora had begun crying, yet he himself wasn't sad or hurt. The brunette told him that it felt like something was squeezing him inside, so Riku decided that someone must be calling for help and that Sora should open up his heart and listen. Though the younger boy didn't understand, he gave it a try. After a moment, when the tears had ceased and the smile returned to Sora's face, Riku knew that his friend had succeeded. The contents of His Majesty, no, Mickey's letter still clear in his head, Riku crosses the bridge to the paopu tree, where Sora sat looking out at the horizon with the letter and bottle in hand. Joining him looking out at the sea, he asked his friend if he made his decision, to which he was given a frank reply. The two were joined by Kairi, and with her arrival and show of understanding, Sora revealed that he had to leave to help everyone hurting, everyone who had made him what he is today. Hearing the expected answer, Riku watched as his two best friends made their departing promise to meet again. After unlocking the seven Sleeping Keyholes, Riku arrived in the same world where Organization XIII had once held its stronghold. Ansem explained that Riku had unknowningly dove into Sora's dreams and become a Dream Eater but he would be of no help to his friends so long as he kept the darkness inside him in check. Riku agreed - but rather than give in to Ansem and accept the darkness, Riku decided to return it to light once and for all. He drew his Keyblade. In the abyss, Riku was attacked by a suit of armour clad in deepest darkness. He defeated the armour and freed Sora from its defenses, then watched helplessly as his friend sank into the darkness. Did he do the right thing? Only Sora's Keyblade remained. Riku took it and unlocked the Keyhole. Riku's eyes blinked open. He was home, on their island. Figures appreaed asking difficuly questions: Roxas; another boy who looked like Roxas; a girl with raven hair. He sensed his answered mattered. When his eyes next blinked open, he found himself in the comapny of Ansem the Wise. Riky woke from his dive to hear what sounded like a celebration; were Sora, Donald, and Goofy having... a party? Sora threw his arms around Riku when he saw his friend was safe. Somehow, it all seemed very backwards. Riku passed the exam. He had shown the Mark of Mastery, and so Yen Sid dubbed him a true Keyblade Master. Sora was happy to see his best friend receive such an honour. The newly named Keyblade Master, and best friends with Sora and Kairi. His first task was to bring Kairi to Yen Sid at the Mysterious Tower in order to recieve new information about the next move in the plan to stop Xehanort. Yen Sid then allowed Mickey to reveal a hidden story about one of the fallen Guardian's of Light, Aqua. Through the story, Riku learnt that Aqua sacrificed herself so that Riku could run to the Door to Kingdom Hearts and close it. When questioned about why the story had been kept secret for so long, Yen Sid explained that if anyone had learnt that Aqua was still trapped in the Realm of Darkness then there was a high chance for someone to stage a reckless rescue mission. However he is confident with Riku's new found abilities and tasks the boy to set off with King Mickey to travel once more into the Realm of Darkness and rescue the lost Master. Gifting the two with clothing designed by the Three Good Fairies, Riku, Mickey, and Kairi all set off on their new quests before Sora even returned home from his trip to the Sleeping Worlds. Recently named Keyblade Master by Yen Sid, Riku has overcome his own past and has grown a resistance to the Darkness. He and King Mickey recieve new clothes from the Three Good Fairies before embarking on a perilous quest to rescue Aqua, who has spent the last twelve years in the Realm of Darkness. During their venture into The Dark World, Riku's Keyblade, Way to Dawn, is broken. He decides to leave it at the beach in the End of Sea, proclaiming it will be left for his "other me". Riku and King Mickey find Aqua, however it turns out they rescued her too late. She had been turned into one of Master Xehanort's Seekers of Darkness. The two return to Yen Sid's Tower, their mission a failure.